BEARS VE License Exams | BEARS Welcomes You! 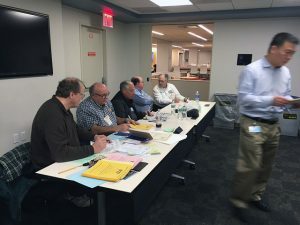 BEARS is pleased to offer Volunteer Examination sessions for current and aspiring hams who seek to obtain or upgrade their amateur radio licenses. Testing sessions are held once quarterly, in January, April, July and October. Exams for all license grades — from Technician through Extra — will be offered at all sessions. The fee for each administration of the multiple-choice exams is $15.00. Please bring the exact fee — in cash — for each test you take. Remember, if you fail a test the first time, you can retake the test as many times as you’d like until the conclusion of the test session. But each test you take will cost an additional $15.00. Also, remember that if you pass the test for one license class, you’re welcomed to try your hand at the exam for a higher license class. But again, you’ll be charged $15.00 for each test you take. Please see the BEARS Activity Calendar for details on our exam sessions, and on our Tech Licensing Prep course, which we are designing in partnership with Fred Usherson / N2EGQ. Fred will lead the course, which is FREE but which requires you to purchase the Gordon West License Prep Guide, available here. Mike Siegel/W2RT is the BEARS’ VE coordinator, and he is ably assisted by Bill Kirkpatrick/WK2O. Please e-mail Mike at VEChair@w2abc.org AND Bill at kirkpatrick@comcast.net for more information, or to register for the exam session. For details on the Tech License Prep Course please e-mail Fred at usherson@gmail.com.